Best of all, it is not even necessary to have an Instagram account or a mobile device to use the functionality. Instagram itself offers no RSS feed functionality which means that it is necessary to use third-party solutions for that. One of the better solutions is porvided by RSS Hub, a free RSS feed generator that is available online. The default RSS feed Url for Instagram is https://rsshub.app/instagram/user/USERID. All that it takes now to create a valid RSS feed is to replace USERID with the actual ID of an Instagram user, e.g. iceland.explore so that the valid RSS feed URl is https://rsshub.app/instagram/user/iceland.explore. You can open the Url in any browser and get the list of feed items, or subscribe to it in any RSS feed reader that you may use. If you have none, I suggest you check out QuiteRSS on the desktop as it is great. The feeds work in any RSS feed reader. Tip: you can download Instagram photos or videos to your PC. One question that may come up is how you obtain user IDs. You may use the website for that but need to know certain entry points. 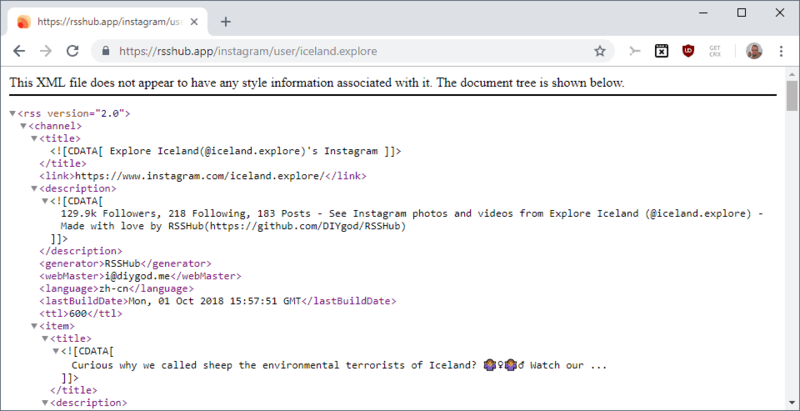 One good option is to open this URL https://www.instagram.com/explore/tags/iceland/, and use the built-in search to find topics of interest. While that returns tags and not individual users, it takes just a click on a posted image to get the ID of the user who published it. Another option that you have on the Instagram website is to type some characters to get username suggestions. Just use suggested usernames directly in RSS feed URLs or load the user's public profile on the Instagram website to look at posted media before you make up your mind. Obviously, you may also look up usernames in the Instagram application to create RSS feeds. RSS Hub provides an easy way to subscribe to any Instagram user using RSS. The service works well and it is really uncomplicated to create new feeds. The main downside is that you subscribe to private accounts or view any content that is not publicly visible. Now You: Do you use Instagram? Time for Zuckerberg to stop being so stingy and up the server costs a bit. Most phones have higher resolution displays than what Instagram can offer and due to upscaling coupled with aggressive JPEG compression everything looks horrible. Still no better suggestion for a desktop RSS reader than Quite RSS ? That’s what I’m using, and it’s all right, but I can’t say I’m exceedingly happy about it. Devs are working on a complete rewrite (QuiteRSS 2.0), so that could be something. Great news ! thought Quite RSS was headed towards the dustbin of history. How to make a RSS of my own soundcloud stream page? I tried multiple similar services and settled to QueryRSS. What’s the update rate of the RSS Hub feeds? And why is it free and competitors’ services such as FetchRSS.com are not?